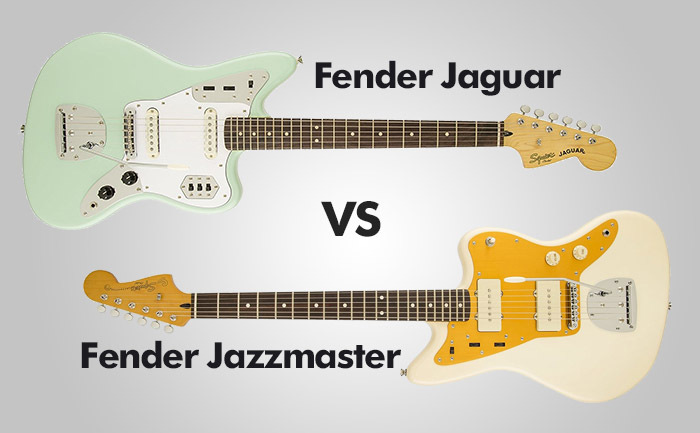 Jaguar vs Jazzmaster – which is better? Fender’s Jazzmaster and their Jaguar came to the scene at pretty close dates – the Jazz surfaced in 1958, the Jaguar in 1962. They’ve amassed plenty of renown and fame quickly, but people don’t seem to be content with the fact that they’re both great guitars from a great brand, hence they just can’t stop comparing them and “pitting” them against each other. In this review, we’ll lay out the similarities and differences between Fender’s Jazzmaster and Jaguar with hopes of finding out which is one objectively better. Fender’s Jaguar comes with a durable basswood body, a C-shaped neck made of maple adorned with 22 jumbo frets, and an ultra playable fingerboard made of selected rosewood materials. It also comes outfitted with Duncan single-coil pickups, a vintage-style bridge plus the floating vibrato, and a set of vintage-like chrome machine heads. Overall, these features are pretty basic, but the true Fender tone, as well as the exquisite feel couldn’t be achieved with anything different. Fender’s Jaguar looks like any other Squire axe, but it comes in a plethora of color variations (the same can’t be said for Jazzmaster, though). The “surf green” is pretty decent and bright, “Candy Apple Red” looks very tasty and alluring, the “Olympic white” might make you mistake it for a Stratocaster, and we shouldn’t forget the infamous “Sunburst” style variation. Regardless of your pick, Fender’s Jaguar looks absolutely ravishing, even in spite of its simplistic, minimalist design. Jaguar’s sound resembles that of a quality Strat – there’s a lot of sustain and precision at the expense of the punchy, beefy tone. If you’re looking for a bright-sounding guitar which can easily adapt to most mellow-like music genres, you should definitely go for the Jag. Surprisingly enough, Fender’s Jaguar isn’t so expensive as most people would assume. As a premium-quality guitar made by one of the most famous brands in the history of guitar making, you would agree with us that the Jaguar should belong to the bottom bracket of the boutique price point category (at the very least). Alas, that’s not so – it’s decently affordable, although a bit more expensive than your average electric guitar. Just like Jaguar, the Jazzmaster features a rosewood fretboard – that means you’ll get an above-average playability and great feel while playing. The body is also made of basswood, even though the batch was a bit different, so you could expect some minor differences in tonal qualities. The neck is made of premium-quality maple, and it’s as durable as they make them – overall, the durability is on point regarding all of the features Jazzmaster comes outfitted with. If there’s one thing about Jazzmaster that sticks out from the rest of its many virtues, it’s the outlook. It appears regal and exquisite, regardless of the color variation you pick. Both Jaguar and Jazzmaster come in Olympic white and Sunburst, but the unique “Vintage White” of Fender’s Jazzmaster can’t even begin to compare to the former. The Jazzmaster has 1.5-inch larger scale, which virtually translates to “enhanced tonal range”. As for the sound quality itself, it comes with a distinctive set of features and it promises quite a lot in this sphere. Note that both Jazzmaster and Jaguar come with a similar set of tonewoods, but they sound drastically different – the Jazzmaster’s tone is sharper, and a bit more addictive for guitarists who want an expensive, quality sound. Just like Jaguar, the Jazzmaster doesn’t cost a fortune. However, it’s not cheap either – it belongs to the upper bracket of the medium-high price point category and does a major bang for the buck. Jaguar sounds pretty mellow in comparison to Jazzmaster, the latter which sports a set of big and wide pickups is capable of punching a hole through the wall if need be. That, however, leads us to the conclusion that Jaguar is a bit less versatile, hence the superior power and all-around performance of Jazzmaster win this round. Even though both of these guitars are made of practically the same set of materials (basswood body, rosewood fingerboard), there are certain differences between them in terms of durability. Namely, the Jaguar is some four years “younger”, and this time gap allowed Fender’s technicians to improve their trade and craft – improved technologies were used, more refined materials were implemented, so it’s clear that this round goes to the Jaguar. That, however, doesn’t mean that Jazzmaster is flimsy – this remarkable guitar is very sturdy, and certain parts of it are even more durable than those of Jaguar (neck, more specifically). The scale length is the biggest, most dominant difference between Fender’s Jazzmaster and Jaguar. Namely, the Jazzmaster features a Fender’s standard length of 25.5” while Jaguar is a bit smaller with 24”. That affects the playability of these guitars in a minor way – the Jag is easier to play and better for beginners and medium-skill players while Jazzmaster is more of a “precision” electric guitar. PROS: Decently balanced soundstage /Superb for bright, mellow music sound genres / Moderately affordable / High-quality, although basic tonewoods / Excellent playability. PROS: Absolutely ravishing outlook / Available in three distinctive color variations / Outstanding playability and quality tone / Sturdy and durable. Pitting Fender’s Jazzmaster against Jaguar feels as if some parents should decide which son they like better – these guitars are made by the same brand, and it’s clear that they had the same concept in mind for each. Anyhow, Jaguar appears to have an edge over his older sibling in terms of price and beginner-friendliness. Even still, these are exceptional guitars and, if possible, you should own them both – they’re well worth the buck and will majorly improve the firepower of your arsenal.